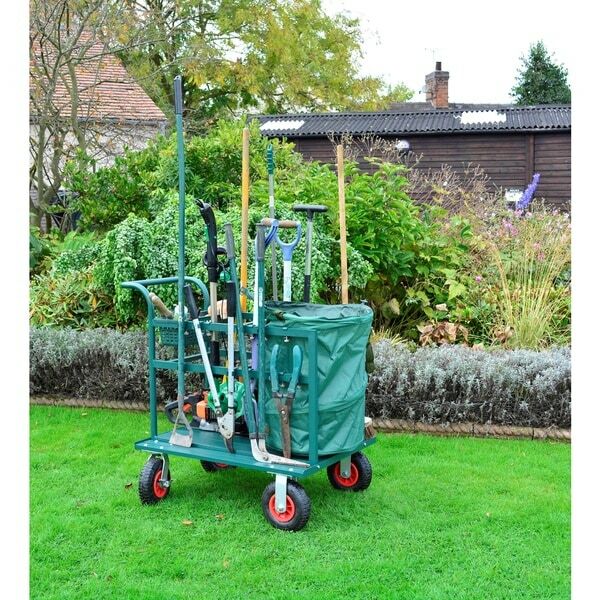 Make gardening a breeze with this Bosmere Garden Tool Cart The Bosmere Garden Tool Cart is a convenient way to store and move you gardening tools to where you are working in your yard. It comes complete with a removable plastic basket and two different sized tool clips that rotate and slide to fit all gardening tools. This heavy duty cart has fixed front wheels and swivel rear wheels with foot break. Aluminium construction is lightweight and rust free. Front wheels are fixed and back wheels move to allow for easy mobility. This cart has a foot brake on the back so you can park it on a slope and comes with a variety of medium and large clips to hold gardening tools. This cart includes a removable plastic basket for extra storage and fits a large garden waste bag or compost bag (not included). Tools not included.